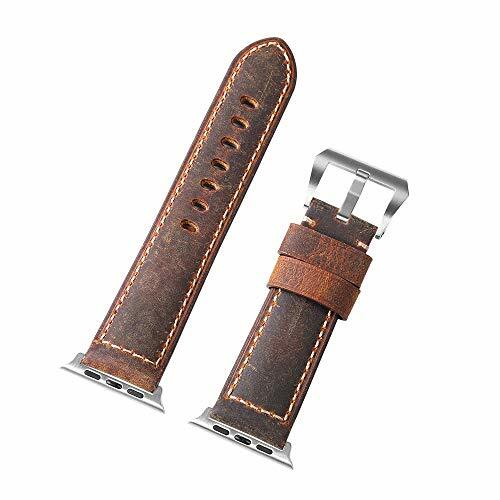 *Change the Life of Your Watch:The fashion design of this vintage watch band would bring a new life to your watch, looks unique. *One year Warranty:Our warranty time is one year as our quality is guaranteed, unconditionally refund or resend with any quality problems. *PERFECTLY MATCHED YOUR WATCH: The adapters precisely connect Apple watch.Perfect for Apple watches Series 3 Series 2 Series 1 Sports and Edition. *Length: 130/75mm, long part with 7 holes is 125mm and short part is 75mm, can fit 6.6-8.5 inch wrist. *High Quality:Selected the high quality genuine leather, Aged by your individual lifestyle, this exceptional strap becomes unique to you.